Welcome to the Municipality of the Township of Potton! Potton Township is located in Quebec’s Eastern Townships, about 120 km southeast of Montreal. This appalachian territory comprises mountains, forests, grasslands, lakes, ponds, brooks and rivers. Lake Memphrémagog, the Missisquoi Nord and Missisquoi Rivers played important roles in the history of the township. Other than the omnipresence of the Sutton range, six important mountains surround Potton: Owl’s Head, Bear, Hawk, Elephant, Sugar Loaf, Pevee and Hog’s Back. Our exceptional environment has brought about the creation of the Green Mountains Natural Reserve, the largest ecological area privately held in Quebec. Its nature trails and those of the Ruiter Valley Land Trust will delight you. Potton Township was named after a town of the same name in Bedforshire, England. We are bordered to the south by Vermont, in the east by lake Memphrémagog, to the north by the Township of Bolton and to the west by the Sutton mountains. The village of Mansonville is the administrative center of the township, which also includes the hamlets of Dunkin, Highwater, Knowlton Landing and Vale Perkins. The Township of Potton, surveyed in 1792, covers an area of about 250 square km. Letters Patent were signed on October 31, 1797 by King George III of England. The Municipality of the Township of Potton was incorporated in 1855. In the years 1660, the Abenakis roamed this territory for hunting and fishing. A century later, the first European settlers from Vermont and Loyalists escaping the american insurrection settle in Potton. Until about 1830, the new colonists were British, followed in about 1850 by French Canadians from the Beauce region. After the great European wars, immigration from Poland, Ukraine and and Russia began. Agriculture, forestry, and sawmills then formed the backbone of the economy. Prior to 1870, the population was primarily Anglophone. Since then the arrival of several French Canadian families, mostly from Dorchester and Beauce Counties, brought a lively francophone presence to the area. Today biculturalism is a part of everyday life in Potton as is multiculturalism as more than twenty different nationalities co-exist in the Township of Potton. 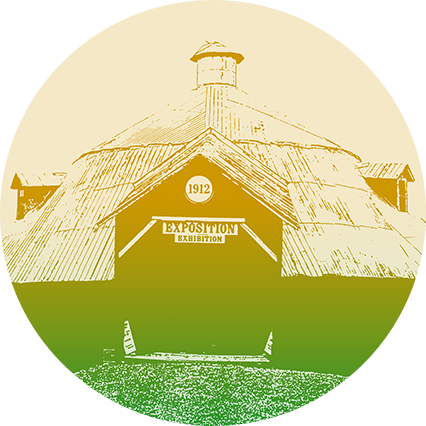 The shape of a barn represents the agricultural heritage that is found throughout the territory, with a reference to the round barn. The summit of the barn, the three green points and the blue point represent the five main mountains of Potton (Singer, Owl’s Head, Bear, Sugar Loaf and Peavey). The green lines symbolize the spectacular nature and mountainous terrain. The blue triangle evokes community, lakes and rivers. The colors represent: nature (green), richness of our agricultural heritage (ocher), lakes, rivers and community (blue). Slogan : Potton, It’s a hoot ! 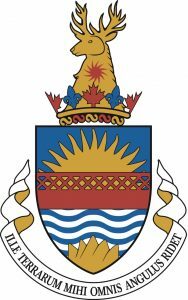 Designed by the Federal Heraldic Service, it was chosen as the town’s official emblem in 1992. The 5 peaks at the bottom represent the 5 main mountains in Potton while the wavy lines its many waterways; Potton’s bright future is seen in the sun; the crown symbolizes Quebec and Canada. The Coat of Arms also includes our covered bridge and a deer over the crown to remind us of the presence of this beautiful animal in our surroundings.